This Organic, naturally golden Jojoba is wonderful for the skin and can be used alone or as a base for essential oils. 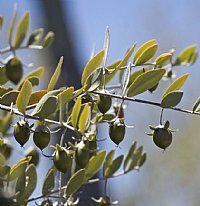 Jojoba is actually not an oil at all, but a liquid wax, and is unique in that it has an indefinite shelf life. This Jojoba is of excellent quality, originating from the best available seeds and cold-pressed to optimize quality, not to maximize yields. Used as a 10% addition to other oils, jojoba nourishes the skin, scalp, hair and cuticles, and has superior softening and conditioning properties. Unlike moisturizers, which don't penetrate through the layers of the skin, jojoba reaches the germinative layer, nourishing and augmenting the health of the skin. In addition, jojoba does not clog pores, making it a wonderful choice for acne. 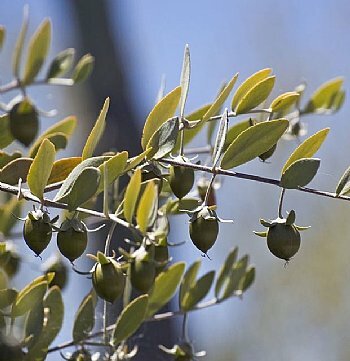 Jojoba is non-allergenic, and is high in proteins and minerals. Jojoba ultimately assumes the odor of the person wearing it. Likewise, it assumes the scent of essential oils added to it. A very useful oil for inflamed skin, psoriasis, excema, and acne. Great for all skin types. Use it all over your body after showering - it sinks in deeply and quickly. Another idea is to rub it into your legs or face before shaving - your skin will love it. Review: Awesome product, offered at a great price. I use it in various skin care products. Thanks Dreaming Earth!